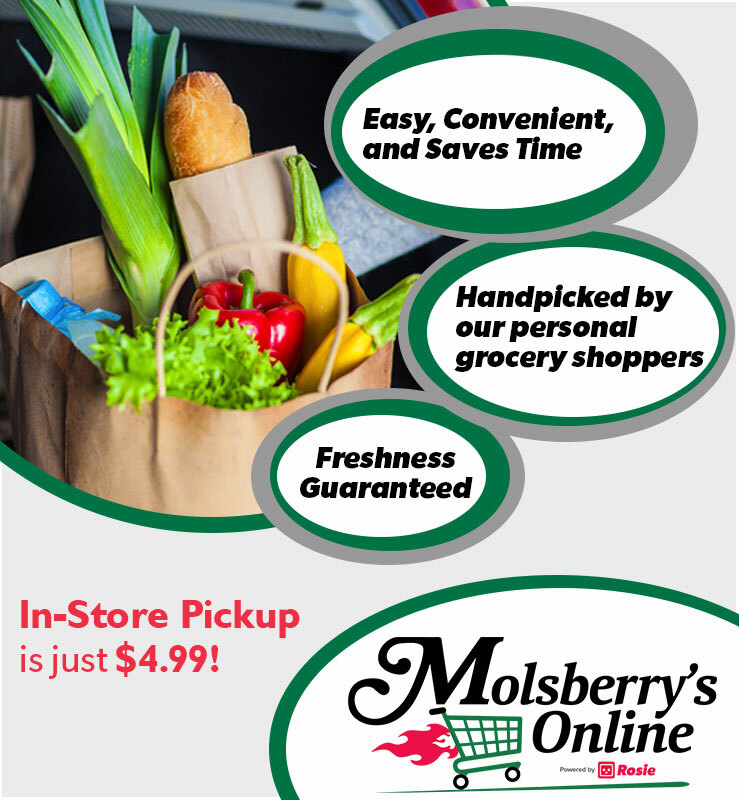 You can shop online with Molsberry's Online Powered by Rosie and have all the groceries you know and love from Molsberry Market available for convenient in-store pickup. Each order is carefully hand-picked by our personal shoppers, and we offer a 100% happiness guarantee on every single order. Shop online in minutes for all your favorite foods, and we'll have it ready for you at a time of your choosing, guaranteed fresh! Molsberry's Online is powered by Rosie, our online shopping partner. To get started, click here to create a free account on Rosie, and then start shopping our complete inventory for all your favorite items. At checkout, choose from available days and times for convenient in-store pickup. You can also download the Rosie App right to your phone! Molsberry's Online is our online grocery service powered by Rosie; all the items you love from Molsberry Market can be purchased online! Shop wherever and whenever it is most convenient for you and we will have your order ready for in-store pickup. It's easy, fast and affordable. Just create an account, add items to your grocery cart, select a curbside pickup time and arrive at the store to get your groceries. Leave everything in the middle up to us! Where is Molsberry's Online available? Molsberry's Online is available at our store location; Molsberry Market. What are the Molsberry's Online hours? The Molsberry's Online grocery store is available to you 24/7. So, you can shop and place your order whenever it is convenient for you. Our specific in-store pickup times are Monday through Sunday from 10am to 7pm.